The first quarter returns for the S&P 500 were quite strong, but if you thought the market wouldn’t have enough energy for a good encore, the first full week of Q2 proved otherwise. With gains on every trading day of the quarter’s first week, the S&P 500 heads into Monday riding a seven-day winning streak and the first five-day winning streak to kick off a quarter since the beginning of 2018. Before that, though, you had to go all the way back to 2010 to find another time where the S&P 500 kicked off the quarter with a five-day winning streak. 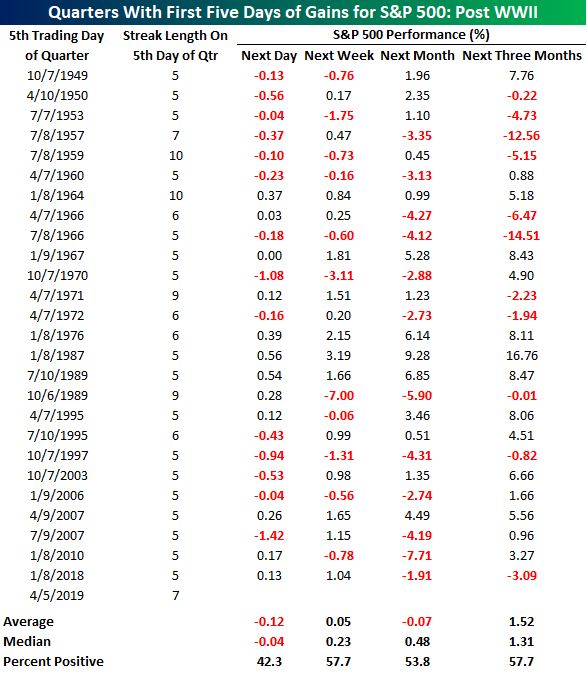 The table below shows every quarter in the post-WWII periods where the S&P 500 was up in the first five trading days of a quarter. For each period we show the date of the S&P 500’s fifth trading day for that quarter, how long the winning streak was as of that date, and then how the S&P 500 performed over the following day, week, month, and quarter. While one would think that a strong ‘first impression’ for the quarter would lead to solid gains going forward, the results don’t back that up. in the 26 prior periods shown, the S&P 500 actually saw an average decline of 0.12% on the sixth trading day of the quarter with gains less than half of the time. One week later, the S&P 500 saw an average gain of just 0.05% (median: 0.23%) with positive returns just under 58% of the time. Moving out three months, the S&P 500’s average and median return are both over 1.3%, but here again, the S&P 500 was only up less than 60% of the time. That’s hardly anything to get excited about, although the one silver lining is that more recently, the S&P 500’s average return is considerably better. In the last thirty years, the S&P 500 has seen positive returns over the next three months in eight out of eleven periods for an average gain of 3.2%. Start a two-week free trial to Bespoke Premium to access our interactive research portal. You won’t be disappointed!